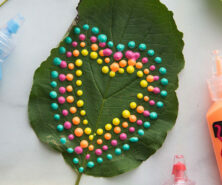 With Spring here we have heard from many of you that you’re looking forward to making some Summer and Spring crafts! 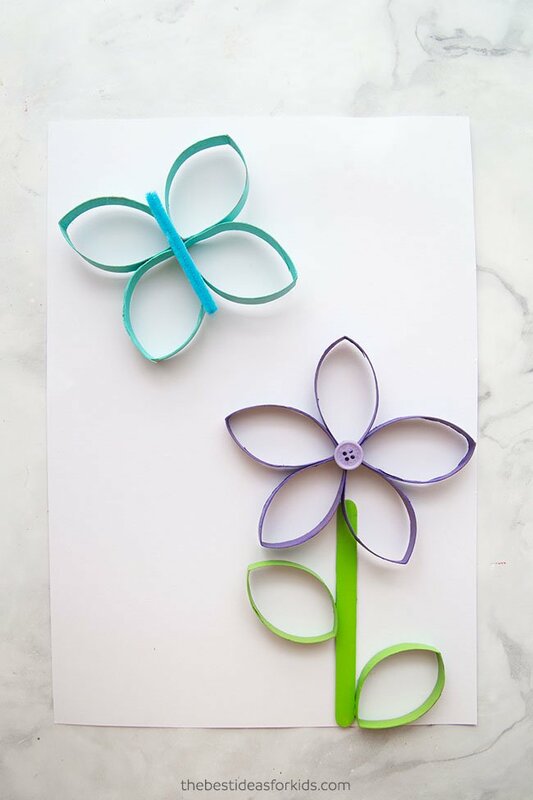 These paper roll flowers and butterflies are the perfect craft to make for Spring or Summer. 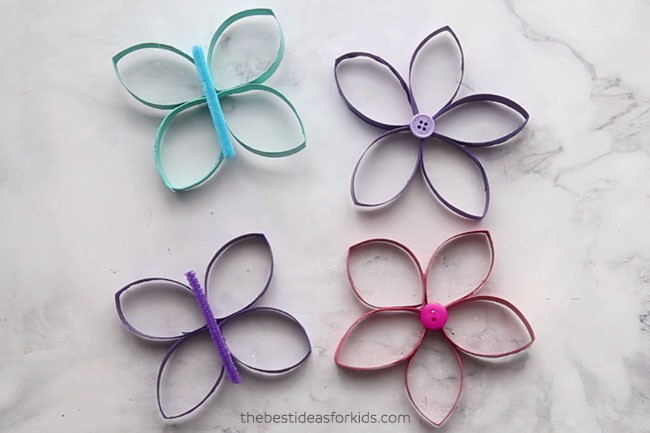 Preschoolers and kids of all ages will love painting and making this butterfly and flower craft! 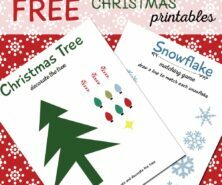 The best part about this craft is you can recycle paper rolls to make these! 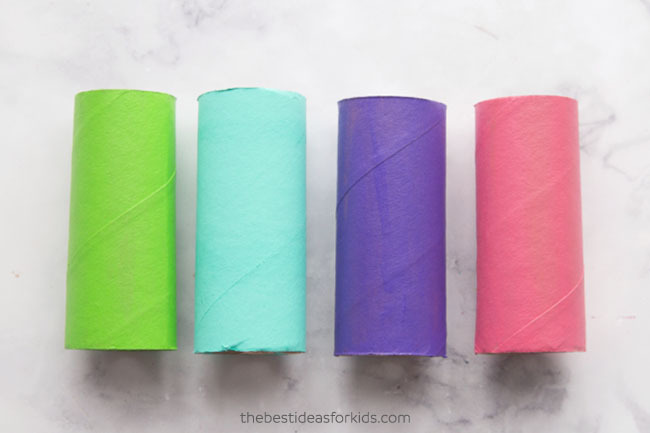 Use paper towel rolls or toilet paper rolls. You can also find these rolls in a craft store if you don’t have a supply of your own. 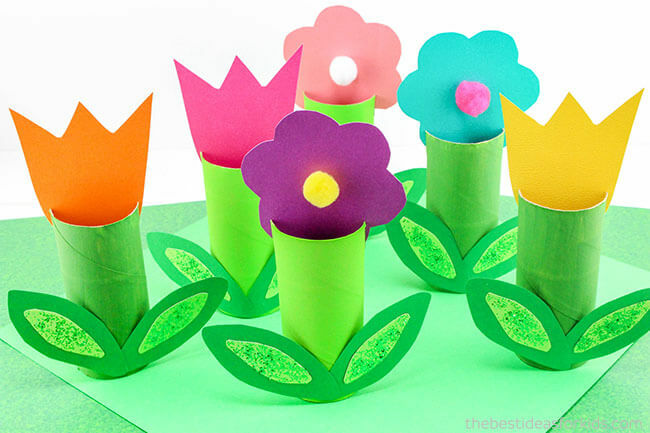 These are great to make for Earth Day to recycle not only your popsicle sticks but also your paper rolls! 1. First you’ll need to paint your paper rolls. Paint the outside first and then let them dry. You may need to paint a few coats if your paper rolls are brown. If they are white they will require less paint coats. 2. Flatten your toilet paper rolls and then cut to about 1/2 cm in size, you should be able to get about 7-8 pieces per roll at this size. 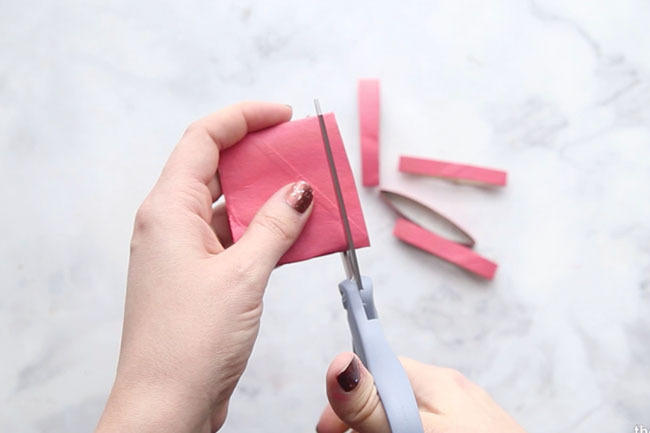 Once cut, it will be easier to paint the inside of your paper rolls. 3. 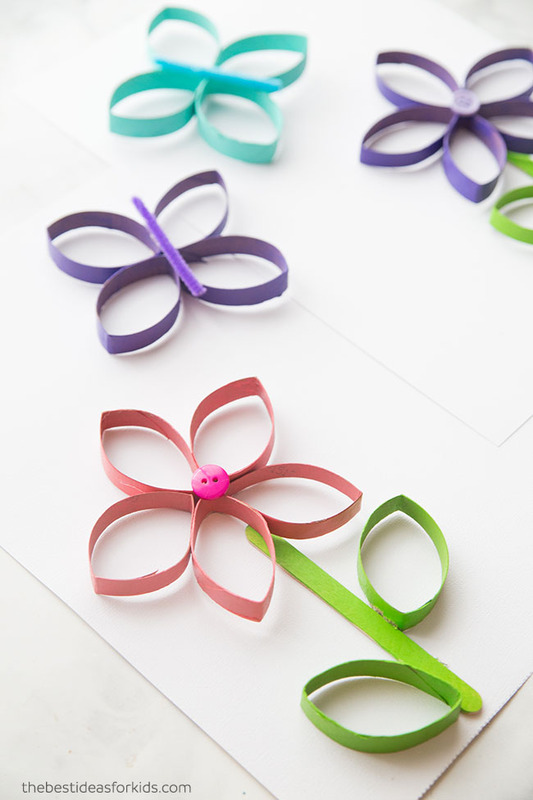 Place a glue dot in between each paper roll to form your butterfly. 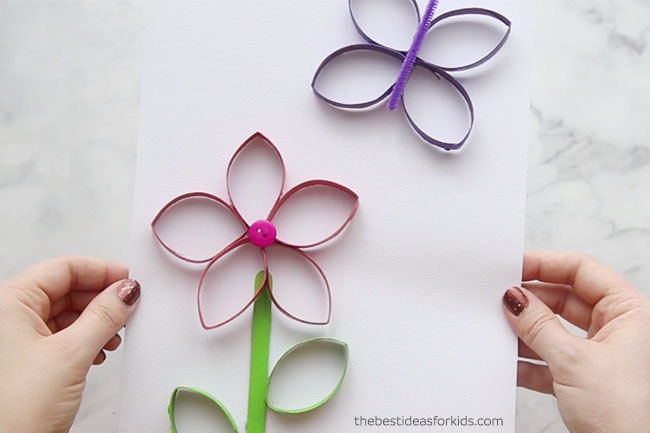 Use 4 pieces of your paper roll for your butterfly and 5 pieces for your flower. You can also glue together with hot glue (adults only). 4. Glue a button on top of your flower and a pipe cleaner on top of your butterfly. 5. Use a glue dot or a dab of hot glue (adults only) to the back center of your butterfly or flower and glue down to your paper. Add a green popsicle stick for the flower stem and then add two leaves to the side. 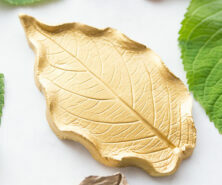 You can dip the leaves in glue and then glue down. We love how these turned out! You can get kids to make only the butterflies or a bed of flowers. The possibilities of different pictures are endless. Attach a string to your butterflies and you can hang them around the house too. 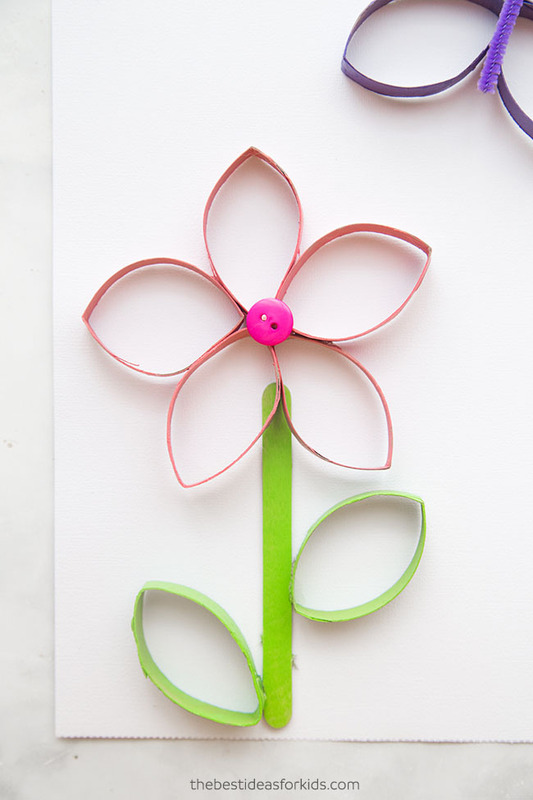 See these other toilet paper roll flowers – these are great for kids to make and place in a window sill for Spring! 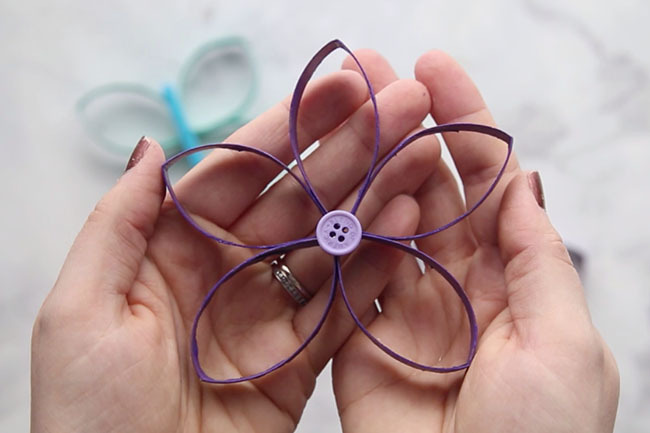 Use up your old buttons and turn them into these beautiful button flower cards! I love making the flowers this year I’m using them to make candle holders can’t wait to get them started!!! So glad to hear that Cathy! I love this. I will definitely do it it with my grandchildren. We hope you have fun Sandra!